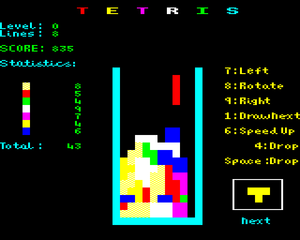 Tetris (Russian: Те́трис, pronounced [ˈtɛtrʲɪs]) is a Russian tile-matching puzzle game, originally designed and programmed by Alexey Pajitnov. 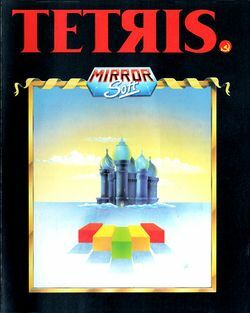 Mirrorsoft's version was the very first commercial release of Tetris in the world. It was unveiled at the Jan 1988 Which Computer? Show and hit the shelves in the UK on the 27th of that month. During the following three weeks, it was also released for the following home computer platforms: Commodore 64, ZX Spectrum, Amstrad CPC, Amstrad PCW, BBC Micro/Acorn Electron, MSX, Atari ST, and Commodore Amiga. The focus of this release was on the European market. Along with the version developed by Mirrorsoft's American sister company, Spectrum Holobyte, it was originally released under bogus licensing. However, contracts were later made between Andromeda Software (the sublicensing party), and Elorg, which secured the legality of the products. The Mirrorsoft releases are notable for prominently displaying the number of appearances that each piece has made. Almost identical to the Amiga version, with only a slight amendment to the copyright notices to give credit to "AcademySoft - Elorg". Features a dire warning at the start mentioning how the game has been banned in its native Russia due to it being dangerously addictive. No music is present, but a tone plays when pieces lock in place, and the tone's pitch is determined by the height when the piece locks. Memorable for its stirring and epic 25 minute long soundtrack composed by Wally Beben, and also for the title artwork by Stephen Thomson, featuring two naked figures in monochrome. Option to choose either music or FX, but not both. 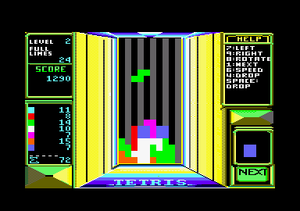 Featured same title screen music and in-game music as Spectrum 128 version, composed by David Whittaker. Background "fuzzy yellow static" animation could be frozen to enhance visibility. 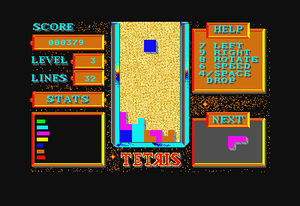 Default "Hall of Fame" scores were set exceptionally high - the player would almost invariably reach the maximum level, (at which point the unresponsive controls and slow DAS would render the game very difficult to play), before beating the top score of 3000. The lines counter maxed out at 99. Six digits were provided for counting score, which would presumably max out at 999999, however, it is estimated that at least 300,000 lines would be required to reach this score. 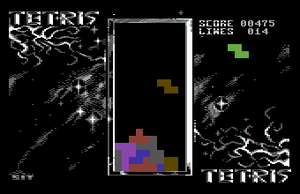 The 48k version has title music only, and sound effects during gameplay. Lines are cleared sequentially, and play a tone with pitch determined by the height. 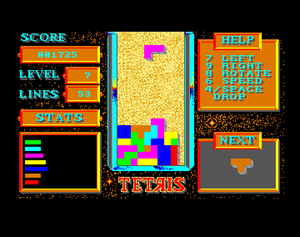 The 128k version had different title music, and also a tune that played during gameplay. Options allowed for either tune or effects, but not both at the same time. Lines cleared all at once, and only one sound effect was used. This page was last edited on 29 September 2015, at 01:32.